The left-hander top-scored with 63 to help India surpass Australia's first-innings total of 300 and then snared three wickets with his spin bowling as the visitors crumbled. 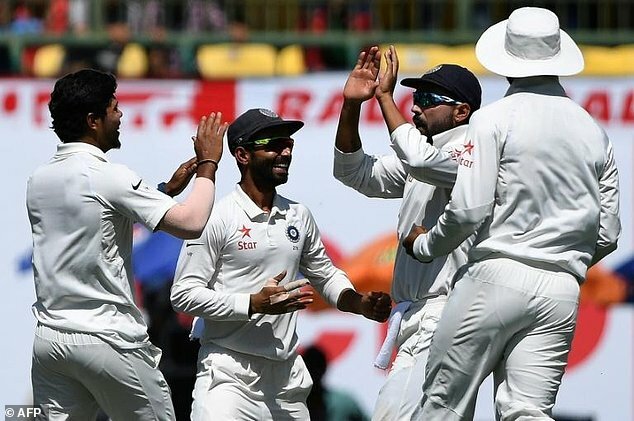 India's pacemen did the early damage, with Umesh Yadav picking up two wickets and Bhuvneshwar Kumar dismissing the in-form Australian skipper Steve Smith for 17 to leave the Aussies reeling on 31-3 inside 10 overs. A short ball from Kumar hit the bottom edge of Smith's bat before crashing onto the stumps in spectacular fashion. 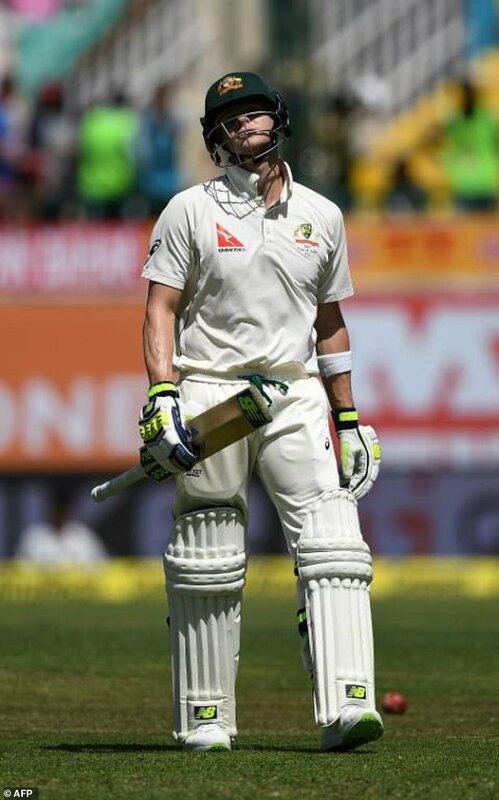 Smith ended the four-Test series with 499 runs including three centuries, only the sixth visiting batsman to have scored so many hundreds in a series in India. The spinners then got down to business on a lively track that offered plenty of bounce, with Ravichandran Ashwin also grabbing three wickets to help his side skittle out Australia for just 137 in the final session. At stumps the top-ranked home side were 19-0, needing 87 more to win the match and clinch the Border-Gavaskar trophy with a 2-1 series scoreline. With two days of play remaining and all their wickets intact, India appear all set to seal a memorable win, capping weeks of controversies and verbal volleys between the top sides. Day three also had its share of drama when Murali Vijay claimed a catch off Josh Hazlewood at the fag end of the Australian innings. Replays however showed the ball had spilled onto the grass. TV cameras then showed Smith fuming in the dressing room and appearing to mumble angrily at Vijay's attempt to claim the catch. Australian batting coach Graeme Hick sought to play down the incident after the day's play. "We were watching it on our own little pads and the ball definitely touched the ground," Hick said. "Having fielded in slips myself, sometimes you're not 100 per cent sure. He would have felt that go into his fingers and felt it was a clean catch. "At times this series has been heated but this game has been played in very good spirit." India got their first breakthrough when Yadav had David Warner caught behind cheaply for six, just after the opener had been dropped in the slips by Karun Nair. Nair had also dropped the same batsman in the first innings. Warner ended the four-Test series with an average of 24.12 -- his lowest in a series of four or more matches, and his third lowest overall. The Indian fast bowlers exploited the pace offered by the wicket to put relentless pressure on the batsmen. Yadav also accounted for Matt Renshaw before Glenn Maxwell put on 56 for the fourth wicket with Peter Handscomb to steady the ship briefly. But Handscomb was brilliantly caught by India's stand-in skipper Ajinkya Rahane off Ashwin while Jadeja dismissed Shaun Marsh for one. Jadeja had played a crucial knock with the bat earlier in the day, starring in a seventh-wicket stand of 96 with Wriddhiman Saha (31) to help India post 332 and swing the momentum their way. "You couldn't have asked for more. Jadeja and Saha batted really well. This morning was really special. The way they batted was fantastic," said Ashwin. "I told Jadeja there was a hundred for the taking. He is a very talented batsman: if he puts his head down, he can get that hundred."